My mother often used this base when she made her sernik (baked cheesecake) – it is a recipe she used in later years as the use of peanut butter is not at all traditionally Polish! Add the lemon rind, egg yolk and peanut butter and cream again. Mix in the flour with a wooden spoon and then using your hand bring this all together to form a soft dough. Place the dough in a fridge for several hours. Use a loose bottom tin (or spring-form tin) 22cm or 20 cm in diameter. Grease the base and sides of the tin. Press the dough onto the base of the tin. Prick the surface of the dough with a fork. Bake for around 15 – 20 minutes until the top is golden. Let the base cool completely before using it. The base must be thoroughly cooled before use. The base can be stored on the tin base for later use if needed – wrapped in foil or in an airtight container. Make your sernik (cheesecake) mixture and pour this onto the base and bake as per your recipe. I used around 450 – 500g of yoghurt cheese with the addition of mixed peel as in my another cheesecake recipe. 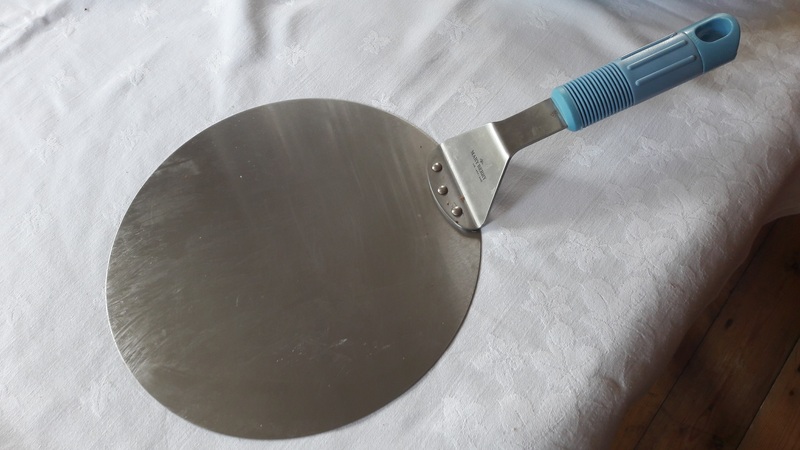 Great cake lifter from Lakeland Plastics. Cake forks are Crazy Daisy by Portmeirion designed by Sophie Conran in 2009. Tea plates are Enchantment by Colclough from the mid 1950s – 1960s.